Holstein breeder Michael Yates is in no doubt of his fortunate position in being able to develop his family’s successful dairy farm business. Lynsey Clarke discovers the determination driving the business at East Logan Farm. Aiming to be as efficient as possible, the Yates family has made considerable investment in recent years to improve its system at East Logan Farm, near Castle Douglas, spurred on by the relentless enthusiasm of son Michael. These changes have helped the business survive the dairy industry’s current crisis, and they remain hopeful the situation will improve. Michael, who farms in partnership with his parents Brian and Sheila and sister Anna, a radiographer, says: “Our objective is to get as much milk from home-grown forage as possible, so the quality of the forage has to be good and management of cows has to be spot on. “We normally sell 50-70 heifers a year, but we are not doing so in the current downturn and, coupled with low milk prices, this is a big loss to the business. The Yates family farms 145 hectares (360 acres), with 80ha (200 acres) of first cut silage and 20ha (50 acres) of whole-crop grown. 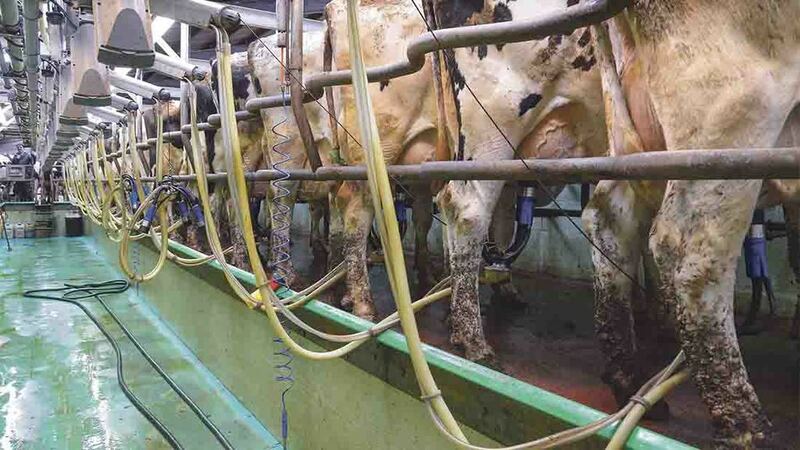 They would ideally be milking 220-240 cows, but the number currently stands at 250 because of heifers which have been retained. This number has increased from 150 in the past 10 years, since the family’s first steading improvements in 2006. At that point, they built a new cubicle shed (which has since been extended), installed a new 20:40 parlour and built a slurry tower capable of holding 500,000 tonnes/year. Michael says: “In 2012, we received a grant through the Scottish Rural Development Programme to help us build a youngstock shed, which can hold everything from eight weeks old until they have calved, and a new covered silage pit. “These changes have made a huge difference to the way our steading works and have dramatically decreased the amount of time spent on manual labour. “Before, we would spend 2.5 hours scraping sheds, but now, we can put two loads of feed in the shed in the morning and scrape the slats, all within half an hour. “It is also much easier for moving cattle and better for herd health and comfort, as ventilation is spot on. 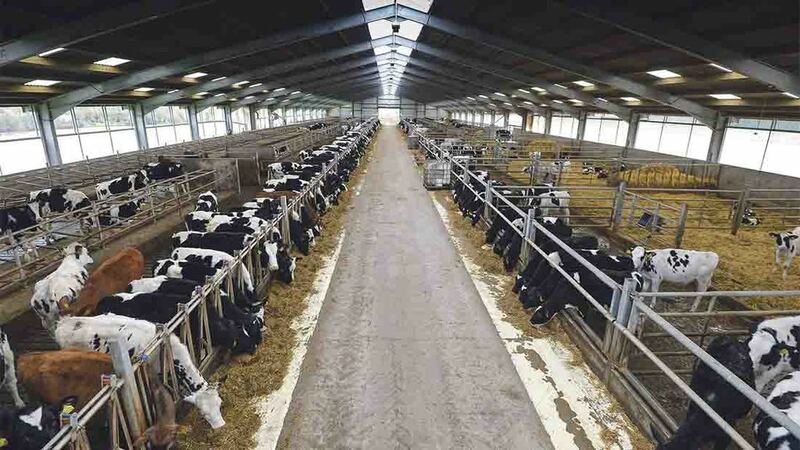 We have made to measure mattresses in cubicles and 90 per cent of cows are now kept inside. The youngstock shed contains a bubbler system which collects slurry from the cow shed and it is mixed 24 hours-a-day. Michael says this mixing has ensured a consistency in slurry which makes it far more efficient when spread on fields, and has allowed them to cut back on bought-in fertiliser. “We now use just 70 units of fertiliser on first-cut silage, 50 units on second-cut and use purely slurry for third-cut. 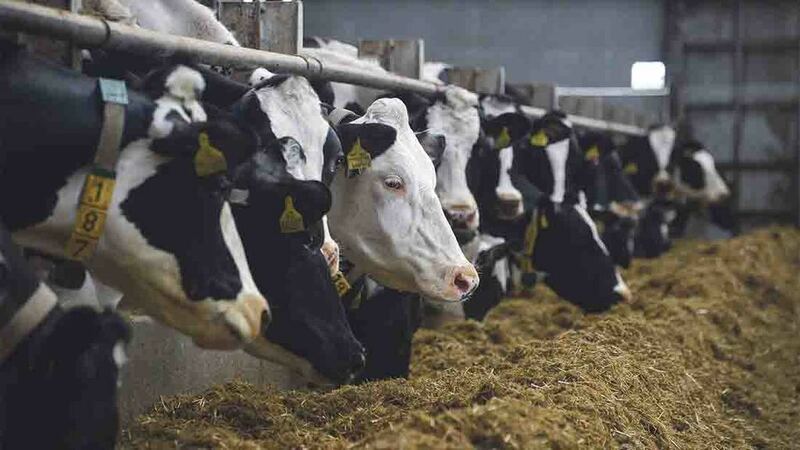 Herd average is 11,500 litres at 3.97 per cent butterfat and 3.13 per cent protein, with a cell count of about 100. Supplying to Arla, the aim is for cows to last for five lactations and Michael says they are particularly selective with which ones they keep in the herd. Milking cows are all fed the same ration, with fresher ones given extra fat and energy, and all stock are fed TMR from eight weeks. Five years ago, the herd switched to three times-a-day milking, which Michael says has been beneficial on yields and herd health. Do you follow Getting Started? Farmers Guardian's hub for all young farmers, new entrants and the place to go for the best business advice, YFC news and updates for those starting out in the industry? Follow us on Twitter and Facebook now! Replacement heifers are mainly home-bred at East Logan, other than the odd few bought-in for showing. Cows and heifers are all AI’d, with a calving index of 405 days – 50 per cent of cows are in-calf by 100 days, and just 7 per cent are not in-calf by 200 days. 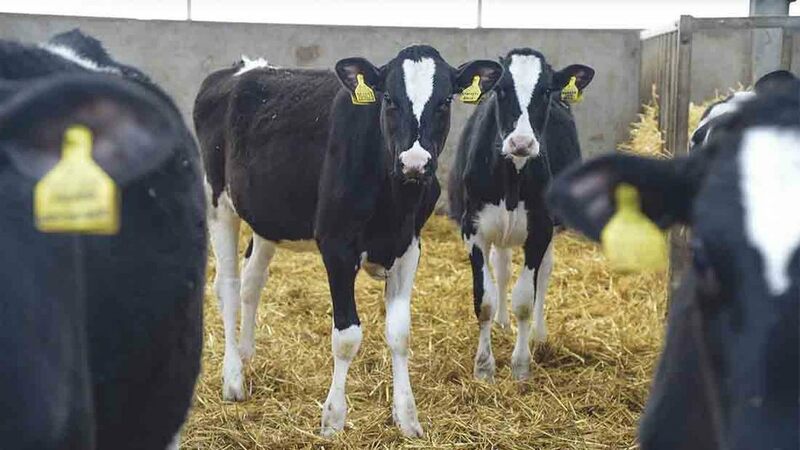 Recently, they have focused on using mainly genomic sires, such as Beemer, Cayle, Hurst, Solomon, Hurricane and Dreamer, and they must be plus for fat and protein. Michael says using genomic sires can help them achieve faster genetic gain, while working with the World Wide Mating Service, through World Wide Sires, and the Reproductive Management System, through Genus, have also proved beneficial. The family has always shown locally, but the past decade has seen them achieve success on a national level, starting in 2006, when home-bred Logan Outside Roxy secured the inter-breed dairy championship at the Royal Highland Show and reserve supreme at the National Holstein Show. Since then, two bought-in females have provided the family with show success – Dilandy Debonair Tabitha Red, shared with the Lawrie family, was Super Cow at Agriscot in 2012 and inter-breed champion at the Highland in 2014. Similarly, Kellywell Marshall Brook, bought privately as a milking heifer, won the Queen’s Cup at the Royal Highland Show in 2013. With the farm’s fairly remote location, Michael says taking cattle out to shows is beneficial as a shop window for the herd, which helps when selling stock. However, there is no doubt the main reason he is willing to put in the required time and effort is down to his passion for bringing out show cattle and the enjoyment he gets from transforming an animal to look its best. This dedication has ensured him wins at the National All Breeds All Britain Calf Show, in the showmanship section in 2008 and 2013, and the clipping section in 2012 and 2013. And through his association with Holstein Young Breeders’ (HYB) Club, Michael has travelled and competed in many different countries, including Spain, Italy, Belgium and Switzerland. At 25, Michael is now nearing the HYB age limit of 26, so he was delighted to be presented with the club’s president’s medal at the end of last year, which recognises significant contribution and dedication to the breed. This year, he will enjoy all the benefits of the win – including a trip to Argentina in April, for the World Youth Dairy Conference, and to Toronto in November, for the Winter Fair. Though he admits they are doing well to stand still at the moment, in the hope of weathering the current storm in the dairy industry, Michael says the family has several ambitions in the showing world they would love to achieve. In the short-term, the family hopes to have one of its cows selected for the European Dairy Show, due to take place in France this year. And, they are hoping their fresh-calvers, the Dilandy cow and the home-bred Logan Sir Eddie, will be on top form for this summer’s show circuit. But Michael is not one to take success for granted and he remains grateful for opportunities he has been given. He says: “My dad always says my grandfather planted seeds so we could reap the benefits. He had the foresight in the 1980s to import a lot of good bloodlines from North America and Canada, which were a great foundation to build the herd on. Next: Cowmen comment: Tim Gibson "Technology on farms is growing fast"